This healthy rice dish is deliciously low-fat with a great mix of Asian flavours. It makes the perfect midweek supper. 1 Bring 2 cups (500 mL) water to a boil in medium saucepan. Remove from heat and add Tea Bags. Brew 4 minutes. Remove and squeeze bags. Add 1 tablespoon (15 mL) Knorr® Chicken Instant Stock Mix and bring to a boil over medium-high heat. Add rice and cook covered over low heat, until rice is tender, about 20 minutes. 2 Meanwhile, season pork with remaining 1 tablespoon (15 mL) Instant Stock Mix. Heat 1 tablespoon (15 mL) sesame oil in large nonstick skillet over medium-high heat and cook pork, stirring occasionally, until done, about 3 minutes; remove and set aside. Heat remaining 1 tablespoon (15 mL) oil in same skillet and cook vegetables, stirring occasionally, until tender, about 5 minutes. Add ginger and cook, stirring, until fragrant, about 30 seconds. Stir in honey and cook just until vegetables are coated, about 30 seconds. 3 Spoon rice onto serving platter. 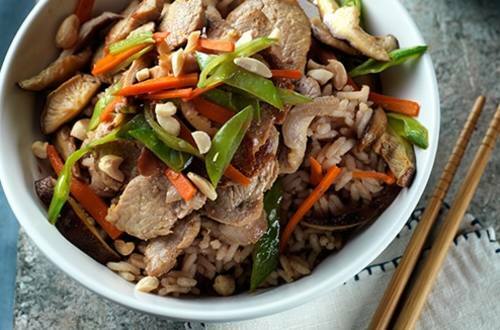 Arrange pork on rice and top with vegetables. Sprinkle with peanuts. Garnish, if desired, with sliced green onions.